Heat oven to 220°C/fan 200°C/gas 7. Place the potatoes in a roasting tin, then rub with 1 tbsp oil and a sprinkling of salt. Roast for 20 mins then add the onion wedges to the tin, giving everything a good shake. Roast for 20 mins more until the potatoes have turned a deep golden brown and the onions have caramelised and softened. Leave to cool slightly. Heat a non-stick frying pan. Dry-fry the bacon until crisp. Add the sliced mushrooms then fry for 5 mins more until they have softened. Meanwhile, make the dressing. Whisk the mustard, vinegar and remaining 1 tbsp oil with a splash of water. 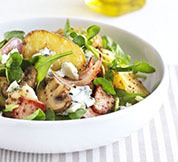 Place potatoes, onions, bacon and mushrooms in a large bowl with the salad leaves, pour over the dressing then toss well. Divide between 4 plates, then crumble over the blue cheese.